2017년 1월 21일, 언제부터인가 박근혜 대통령 탄핵 촛불의 맞불집회로 서울 종로구 덕수궁 대한문 앞에선 ‘대통령 탄핵기각을 위한 국민총궐기운동본부(탄기국)’ 회원들이 태극기 집회라는 명목으로 맞불집회를 열었다. 말로는 애국보수, 보수집단, 국가를 살리러 나왔다는 명목하에 노인들을 위주로 구성된 박사모 등 으로 구성되어있다고 한다. 언론의 증언에 의하면 태극기 집회에 참가하면, 목욕을 하고 깔끔한 모습으로 나오면 5만 원, 유모차를 끌고 나오면 15만 원을 받는다고 보도되어왔다. 명칭은 ‘애국 태극기 집회’라고 하였다. 그들의 외침에는 우리 각하가 살아야한다, 빨갱이들은 물러가라, 너 어디 기자야 라는 말이 유행어처럼 번졌다. 그곳은 더이상 정상적인 사고가 돌아가는 곳이라고 생각되지 않았다. 대통령이 신격화된 공간, 그곳이 태극기 집회였다. 그런데 여기서 의문이 있다. 그러나 그들의 손에는 태극기와 성조기 2개의 국가의 깃발이 들려있다. 왜일까. 일장기도 아닌, 인민기, 오성홍기도 아닌 왜 성조기였을까. 의문이 생겼다. 성조기 뿐만 아니라 미국 45대 대선 당선자인 도날드 트럼프 사진도 집회 참가자들 손에 들려져 있다. 그들은 대한민국이 미국의 속국이라고 생각하는 것일까, 미국의 또 다른 주(states)라고 생각하는 것일까. 이 나라는 더 이상 글러 먹었으니 미국 국민이 되고 싶은 생각이었을까? 자신들이 신격화한 대통령을 살려달라고 미국이라는 강국에 애원을 하는 것 처럼 보였다. 그것은 마치 어린 아이가 부모에게 내 상황이 이러하니 도와주라고 떼를 쓰는 것과 흡사했다. 작업은 태극기와 성조기가 어떤 상관관계가 있는지 질문을 던진다. 새로운 것이나 변화를 적극적으로 받아들이기보다는 전통적인 것을 옹호하며 유지하려 한다는 뜻의 보수라는 이름을 걸고 박근혜 대통령을 구하려고 모인 집단의 손에 들려 있던 성조기는 더이상 대한민국 국민을 포기한, 그렇다고 미국 국민도 아닌 애매모호한게 낀 “대한미국인”이라고 생각했다. 참가자들은 언론과의 인터뷰에서 성조기를 든 목적은 우방국가라서 들었다고 말했다. 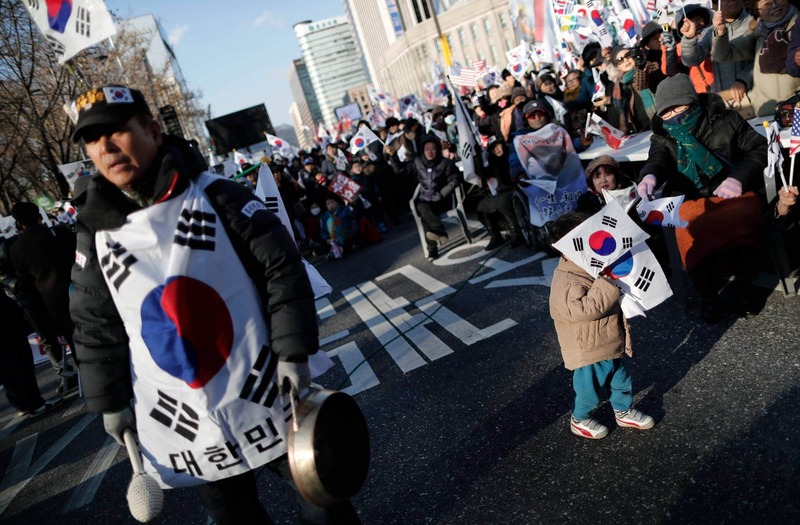 On January 21, 2017, members of the National People’s Solidarity Movement for Rejecting the President’s Impeachment in front of the Deokguk Palace in Jongno-gu, Seoul, opened a rally in the name of Taegeukgi. In word they consisted of patriots, conservative groups, and the elderly who came out in order to save the nation. 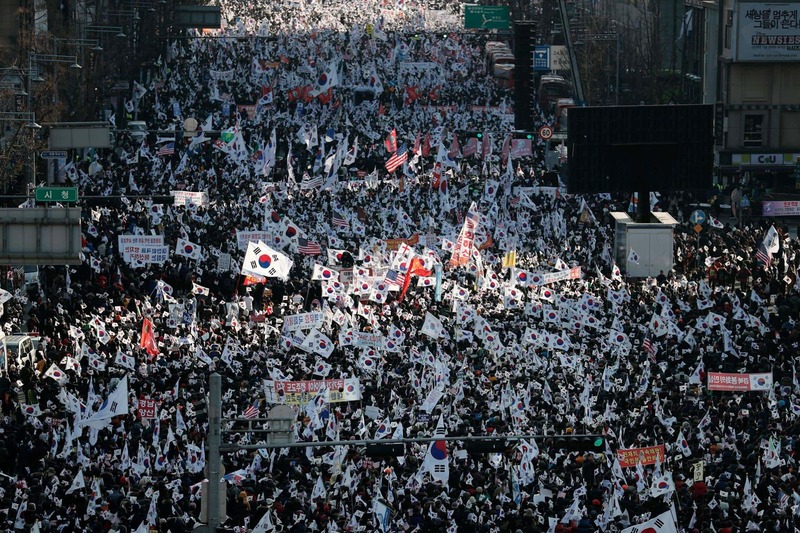 But, according to the media, those participating in the Taegeukgi rallies were reported to have received 50,000 won for showing up in a clean state, and 150,000 won if they pulled a stroller. 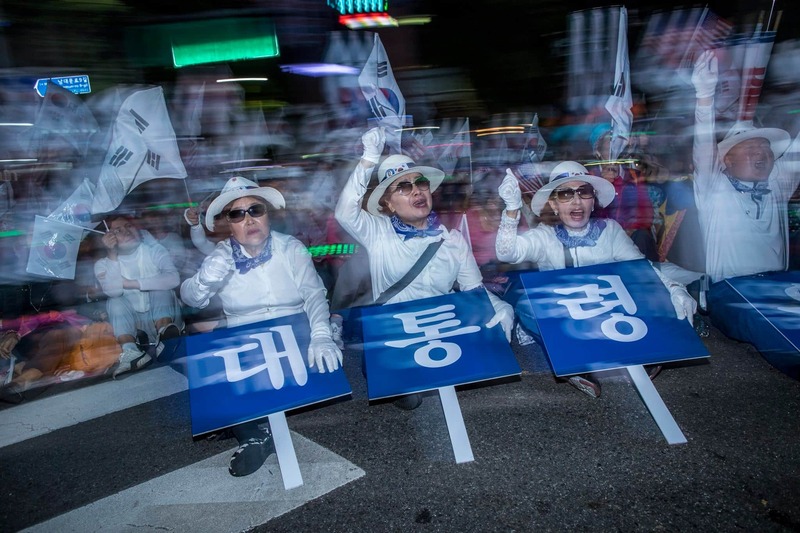 Their title was the ‘Patriotic Taegeukgi Rally’. 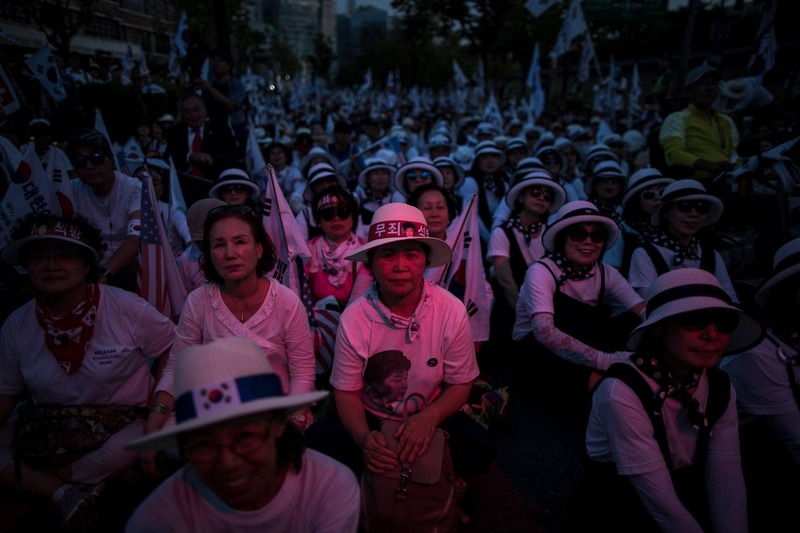 They cried out chants such as, “We must save our leader” and “Communists go away.” “Who are you reporting for?” became a popular accusation against journalists. I did not think that there was a normal incident anywhere. But here is the question. Why are there flags of two countries in their hands. Why? That is the question I have. 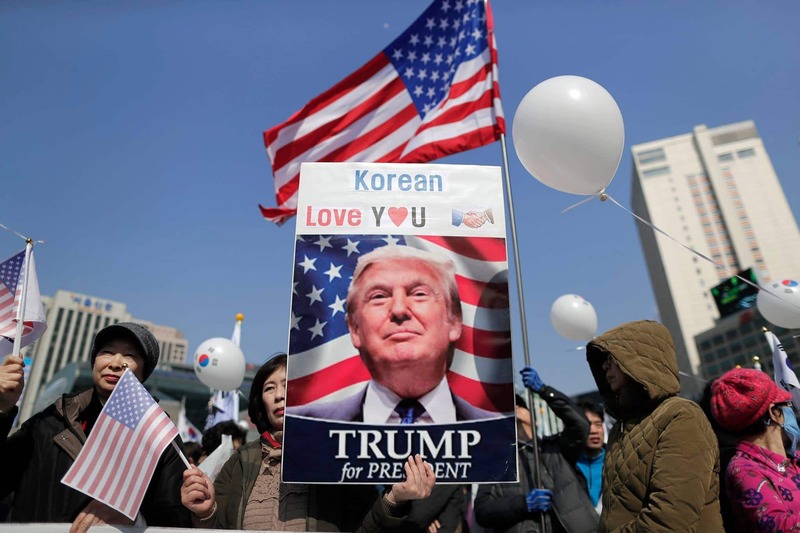 It’s not only flags, but pictures of Donald Trump, the 45th President of the United States, which were held in the hands of participants. 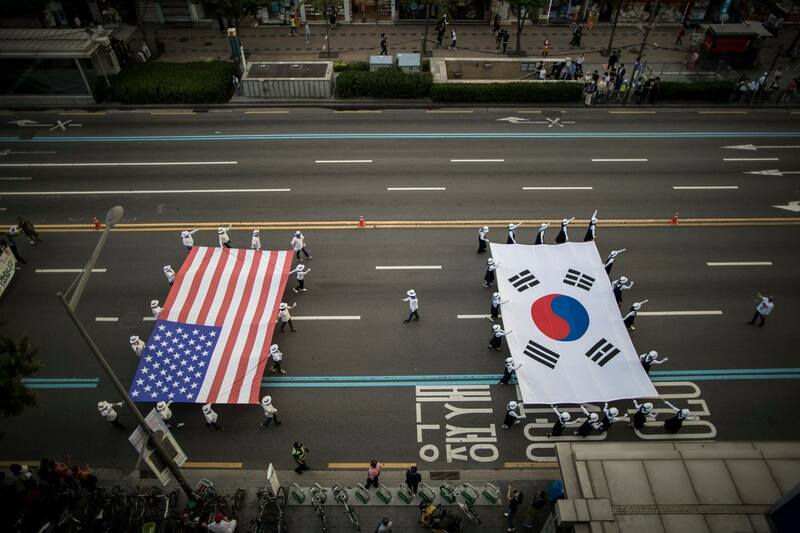 Do they think Korea is a tributary state, or another state of the United States? 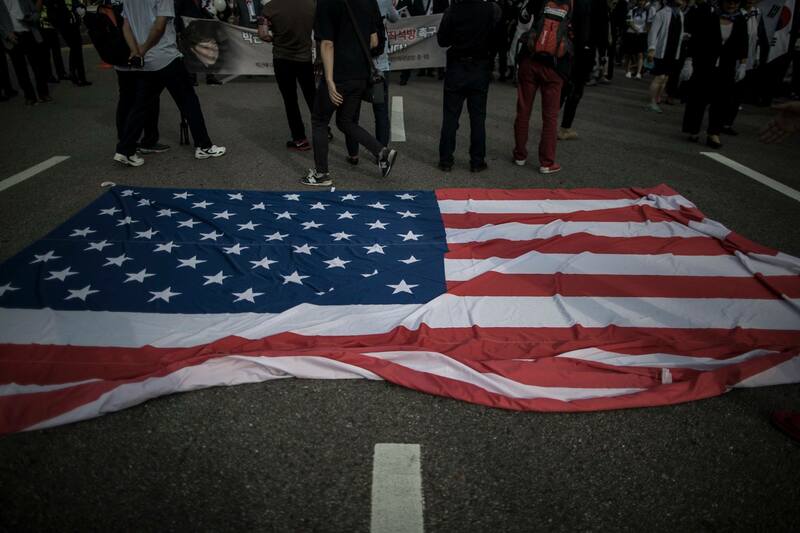 Did they want this country to become part of America? It seemed as if they were begging the United States of America to save their president whom they worshiped.The situation was akin to a child complaining about their situation and asking their parents for help. 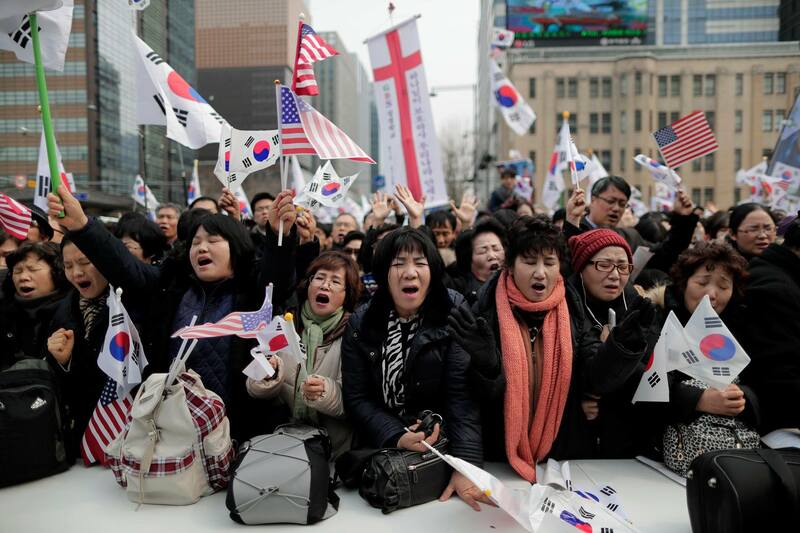 In interviews with the press, participants said that the purpose of the flags were to be a friendly country. Bio: 정병혁, 정희망이라고도 부릅니다. 대한민국 경기도 부천에 살고있고, 중부대학교 사진영상학과 4학년에 재학중이고, 사진기자를 목표로 공부하고 있습니다. 고등학생 때 따로 사진을 배우지 않았고. 그냥 어려서부터 부모님과 함께, 또 의도치 않게 주변에서 집회, 시위, 정당활동, 사회가 돌아가는 현상들을 많이 보고 경험해볼 수 있었습니다. 2008년 광우병 집회가 일어나면서 참가자로 있을 때, 단상에 모여있는 사진기자들이 뭔가 멋있어 보였습니다.. 그게 사진을 시작하게 된 계기였다. “나 역시 저 위치에 서서 이런 현상을 기록하겠다”라고 생각했고, 저 사람들은 뭘 기록하고 뭘 보고 있을까라는 것이 가장 궁금한 이유였습니다. I am known as Jung Byung Hyuk as well as Jung Hee Mang. I live in Bucheon, Gyeonggi-do, Korea, and I am in my fourth year studying photography at Joongbu University and aiming to become a photographer. I did not study photography separately when I was in high school. I was able to experience a lot of events such as rallies, protests, and other political activities while around my parents during my youth. When I was a participant in the 2008 mad cow rally, I saw the photographers gathered on the podium and thought they looked cool. That was when I began an interest in photography. I thought “I would also like to stand in that position and record this phenomenon,” and I was curious to know what they were recording and what they were looking at. 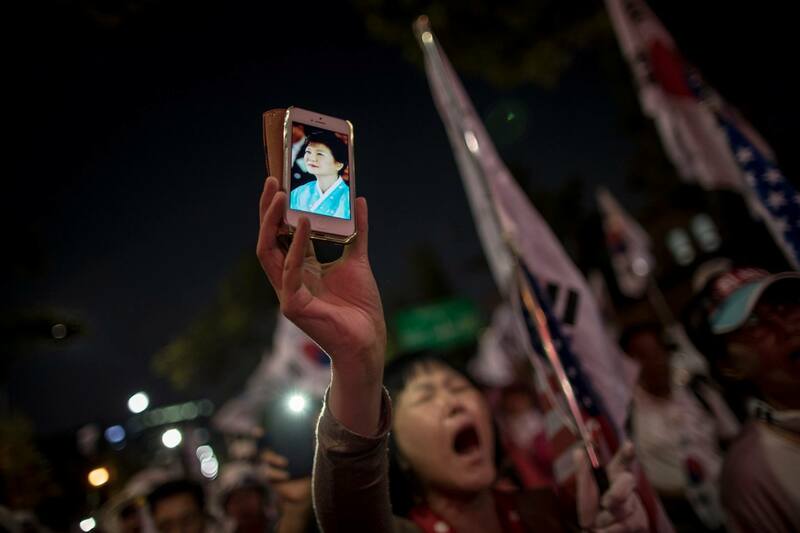 You can follow more of Jung Byung Hyuk’s work here.